Citigroup downgrades Tesla's stock to a sell rating in light of the SEC lawsuit against CEO Elon Musk. "We think even after the post-close stock pullback (to $274), risk/reward is still tilted negatively," Citi says in a note to clients. The SEC alleges the CEO mislead shareholders when he said he had secured funding for a buyout; shares are down sharply in premarket trading. 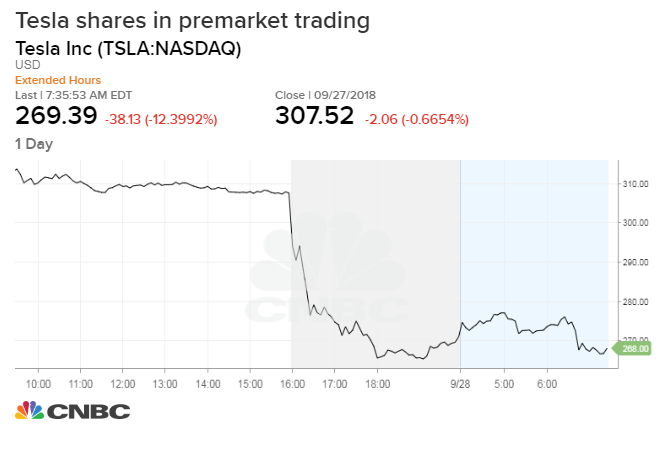 Citigroup downgraded Tesla's stock to a sell rating from neutral Friday, a day after the Securities and Exchange Commission filed a fraud lawsuit against CEO Elon Musk. The brokerage detailed two paths forward for the electric car maker, one with Musk and one without. And both options aren't great for stakeholders. "There's little question that Mr. Musk's departure would likely cause harm to Tesla's brand, stakeholder confidence and fundraising," the note said. "If Mr. Musk ends up staying on, the reputational harm from this might still prevent the stock from immediately returning to 'normal.'" "Ultimately it's a risk/reward call we approach from a 50/50 chance of 'bad' or 'Ok/good' outcomes; we think even after the post-close stock pullback (to $274), risk/reward is still tilted negatively," state the note. Citi also cut its price target on Tesla to $225, implying more than 25 percent downside from Thursday's close. Shares fell 13.9 percent Friday, posting their worst day since 2013. The Securities and Exchange Commission filing in Manhattan federal court alleges that the CEO mislead shareholders on Aug. 7 when he announced he had secured funding for what might have been a corporate buyout. Specifically, the government holds that Musk issued "false and misleading" statements and failed to notify regulators of material changes at the company. Musk later explained that he had spoken to representatives of the Saudi Arabian sovereign wealth fund and felt confident that the funding take to the company private was assured at his proposed price of $420 per share. Musk called the SEC's allegations "unjustified" and said he "never compromised" his integrity. "This unjustified action by the SEC leaves me deeply saddened and disappointed," Musk said in a statement. "I have always taken action in the best interests of truth, transparency and investors. The SEC is seeking to forbid Musk from serving as an officer or director at any publicly traded company. The lawsuit, which did not name Tesla as a defendant, comes as the company struggles to mass produce its Model 3 sedan. Since the company started to ramp up production last July, its already-slim cash hoard as dwindled, sparking concerns on Wall Street over whether Musk will need to raise additional capital. For his part, Musk has repeatedly said Tesla won't need to seek new cash and guaranteed to keep Model 3 production at a steady clip in an effort to help the company turn cash-flow positive and profitable this quarter.